That’s true of war-making and foreign policy, as well. Who’s behind the White House, and who’s therefore behind U.S. foreign policy, more or less? 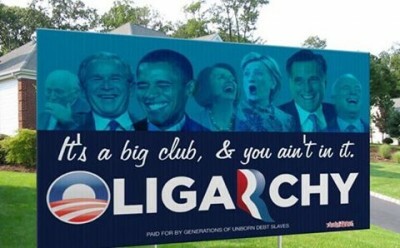 I think the answer today is the oligarchs. Which would be the same answer, – incidentally, ironically, if you will – for Putin in Russia. The people who own the wealth, the people who therefore have the power and who more or less (and I’m not being too facetious here) buy the president and thus buy American foreign policy. Indeed, we have thoroughly documented that war is bad for the economy and makes us poor. But war is very good for a handful of defense contractors and banksters who make huge sums from backing unnecessary war. INTERVIEWER: One of the things that always hits me is that – once you look at the predictions of who would win in world war 2 – mostly what I’ve seen is that by 1940 or ’41 it was pretty clear Hitler was going to lose. If you’re in the German monopoly capitalist class doing analysis, you’re thinking, “Now this is not going to lead to anything good for us. Why aren’t we bailing?” But the forces of refusing to accept the reality of it were far too strong. COLONEL WILKERSON: That’s a good point. I would say – and I don’t subscribe to conspiracy theories, normally – but I would say there were forces behind that shadow, if you will, who were doing quite well. Swiss, Germans, Americans and others who were more or less feeding off the conflict, and got very wealthy feeding off the conflict. Just as they did off of World War 1, even more predominately with respect to the United States, in particular. German reparations and so forth. We made a ton of money off of World War 1. And we really didn’t contribute a whole lot, if you remember. We were really only there substantially for a very short period of time, roughly April 1917 until Armistice Day. So, there is a group which is interested in this kind of thing – and this group alarms probably more than any other in the world, particularly in my own country – that is interested in a constant state of war, or as near a constant state as possible. Because they sit behind all the belligerents and make money. (Indeed, bankers profits so much from war that they often back both sides. For example, American banks funded the Nazis during WWII when America was is in the middle of a war against German). In some respects this shadow behind the power that makes money off war period – no matter who’s the belligerent – makes money off that volatility now. Especially with computers that are able to to assist them in doing so. Like currency manipulation, for example, or just general speculation. With computers, you can do it at lightning speed. And you can do it in a nanosecond. And you can make billions in that nanosecond.And you don’t care about what you’re doing to the real economy because you’re raking in the dough. In other words, destabilizing countries and creating chaos can make modern war profiteers rich. Jim Baker and George H.W. Bush really accomplished what, I think, is one of the real diplomatic feats of the 20th century: the reunification of Germany, whether we agree with it or not. And they did it without a shot being fired….One of the reasons they could it is that they assured Gorbachev and later Yeltsin that NATO that they would be quiescent, it wouldn’t move, it wouldn’t threaten Russia.In fact, I was there when they promised the Russians that they were going to make them a member [of NATO]. An observer first, and then a member ….Well that fell apart when they perceived right quickly that we weren’t really serious. And then we start – under pressure from Lockheed Martin, and Raytheon and others – to sell weapons to Poland, and weapons to Georgia, and weapons to Romania, and everyone else we could bring into the fold. Under those pressures and others we started to expand NATO, and stuck both our fingers in the Russian eyes, so to speak, immediately. It’s clear to me why Putin has responded to Georgia and why he’s now responding to Crimea and Ukraine. That’s what great powers do when they get concerned about their so-called “near abroad”. Additional background. And see this.